Tara Butchery in Durbanville, Cape Town, ran a controversial poster on National Braai Day on 24 September, South Africa’s cultural heritage day. Local politician Julius Malema, president of the African National Congress Youth League, had recently made headlines with his racial slurs of “Dubul ibhunu” (Kill the Boer), contained in the freedom song “Ayesaba Amagwala (The Cowards are Scared)”. 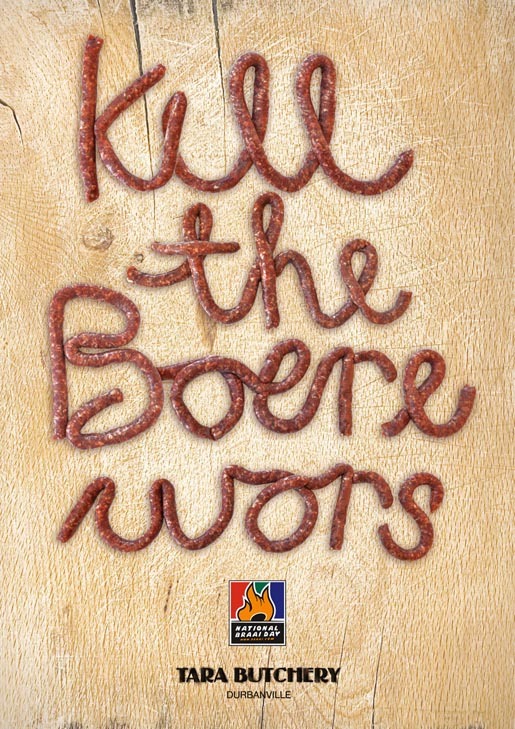 Tara Butchery ran a poster with the more appropriate words, “Kill the Boerewors”, a reference to South Africa’s traditional sausage on the day of traditional grilled meats. The Kill The Boerwors campaign was developed at Bester Burke Slingers, Cape Town, by executive creative director Stephen Burke, creative director Wallace Seggie, art director/photographer Tim Jones, and photographer Kirsten Felbert.